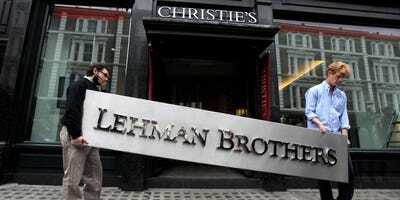 Oli Scarff/Getty ImagesA sign from Lehman’s London offices was sold at prestigious auction house Christie’s. September marks 10 years since the collapse of Lehman Brothers, the biggest bankruptcy in US history, and the most significant moment of the financial crisis. Details of the event are a closely guarded secret. LONDON – The 10-year anniversary of the collapse of Lehman Brothers is just weeks away and, for most people, it will be a reminder of the banking excesses that led to the financial crisis. For some former Lehman staffers, however, the anniversary is a chance to have a party. According to a report from Financial News, hundreds of former Lehman bankers are set to attend an event to commemorate the anniversary of the bank’s demise, scheduled to take place around September 15, the day the bank went under. “It’s hard to believe it’s been 10 years since the last of our Lehman days!… One of the best things about Lehman was the people. What better way to celebrate the tenth anniversary than getting everyone from former MDs to former analysts back together again!”, an emailed invite to the event said, according to Financial News’ report. The venue of the event is unknown, although Financial News reports that it was originally scheduled to take place at The Conduit Club in Mayfair, London, before that event was merged with another Lehman reunion. Details of the event are believed to be a closely guarded secret, given its sensitive nature. “People will be absolutely disgusted about this unacceptable and highly inappropriate gathering,” he told Financial News. The collapse of Lehman Brothers in September 2008 was undoubtedly the most memorable moment of the devastating financial crisis that struck between 2007 and 2009. By the time Lehman collapsed, the crisis was already crystallizing but its demise was the point at which regular folks sat up and took notice. Images of Lehman workers holding crisis talks and eventually clearing out their desks at the bank’s London office have become seminal reminders of the crash.